It is a computer-controlled, patient-interactive, physical medicine system. It provides a high-tech form of treatment termed Non-Invasive Disc Rehabilitation (N.D.R.) that is compatible with conventional medicine and other respected alternative therapies. This form of treatment is the product of the information age and is made possible only with today's hybrid computer systems. 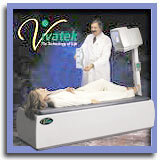 Vivatek's treatments are gentle and painless. Patients look forward to each soothing, satisfying and highly therapeutic treatment - some actually fall asleep during N.D.R.! N.D.R. is the new acronym for the new millennium. It says what it does. As its name implies, N.D.R. is completely non-invasive - no surgery, drugs, needles or side effects. It is a treatment for one of humanity's oldest and most persistent pain producing conditions. The spinal disc has been identified as the culprit for most back and neck pain producing conditions. A bio-mechanical lesion (def.) may be the beginning of ongoing pain syndromes but the disc and associated structures are the major cause of pain and neurological malfunction according to the latest and most reliable scientific research. Disc deterioration most commonly begins with a bio-mechanical lesion as a result of a traumatic event or from repetitive trauma. Whatever the cause, whether by a lifting incident, lifting at a wrong angle, auto accident, repetitive trauma such as sitting in front of a computer or assembly line hour after hour or from daily activities of living and aging, disc deterioration is a proven and documented outcome. Following the initiation of the bio-mechanical lesion the intradiscal fluid (def.) exchange ratio is disrupted. The intradiscal fluid exchange ratio is the amount of fluids evacuated from the disc during load bearing activities in relation to the amount of fluids absorbed by the disc during non-load bearing activities. Anytime intradiscal pressure is elevated inflow of nutrients and oxygen stops and disc deterioration begins. A bio-mechanical lesion also causes the activation of the mechanoreceptor fibers (def.) resulting in muscular reaction and contraction. Prolonged muscular contraction or spasm results in increased intradiscal pressures even when the patient is non-load bearing. This accelerates and compounds the intradiscal fluid exchange problem. 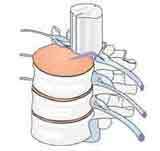 A degenerative, desiccation or drying out process is initiated inside the intervertebral disc. Disc spacing begins decreasing which allows the angular criss-cross pattern of the disc annular fibers (def.) to increase which causes tear sites to form. These tear sites allow migration of the nucleus pulposus (def.) outward resulting in disc bulge and herniation. This deteriorative process is simultaneously occurring on and around the outside of the disc as well. This inflammatory reaction is in itself pain producing as well as hypersensitizing to both motor and sensory nerve fibers. Toxins, especially neurotoxins form. This results in increased pain and increased myospasm (def.) which evolve to an ever increasing and ongoing pain syndrome. Relieving pain with medication and anti-inflammatories gives temporary relief at best. . . but can result in serious side effects. Physical therapy, acupuncture and spinal manipulation can also temporarily relieve pain, but until the primary element of the pain production is addressed, recurring episodes with ever increasing pain intensity will follow. Years of research have proven conclusively that complete resolution requires a therapy that addresses all elements of the pain syndrome. International Therapeutic Machines (I.T.M.) has developed a treatment system that provides Non-invasive Disc Rehabilitation (N.D.R.). The therapeutic device that provides N.D.R. is called Vivatek. After prescribing a treatment code specifically addressing the patient’s condition, the doctor’s time and attention can immediately focus on other patients. Unassisted, Vivatek will deliver a variety of effective, soothing, billable, treatments. While the patient is being treated the Vivatek Education Video Monitor delivers a health care class explaining the importance of keeping future appointments and referring friends and family to this wonderful new treatment system. Most patients experience immediate pain relief. They return more often. They tell their friends. Vivatek accomplishes many things simultaneously which results in a synergistic effect. Now, humanity has achieved the multi-tasking technology made possible only through computer technology to achieve the simultaneous and integrated resolution of the complete pain syndrome. Vivatek's soothing, satisfying and therapeutic Non-invasive Disc Rehabilitation is not an elite treatment just for the wealthy. Physicians, attorneys, insurance carriers and workers comp carriers recognize the predictable, high quality treatment this system provides. Vivatek is truly the ultimate evolution of the healing arts-- no drugs, no surgery, no side effects and no more pain.